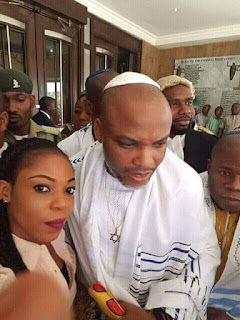 The Leader Of The Indigenous People Of Biafra Citizen Nnamdi Kanu, who promised to sink Nigeria through his Testimony, have on Wednesday the 1st day of March 2017 demand in Federal High Court Abuja that Justice Binta Nyako the presiding judge, allow him to speak in Court, but it was declined. Justice Binta Nyako in fear threatened to declare the defendant "Unruly" if he testifies against Nigeria and as well try him and other defendants without arraigning them in court. The first defendant, Citizen Nnamdi Kanu further told her, he is the accused, hence he does have the right to give his testimonies and should be allowed to speak. The denial of IPOB Leader's request, brought about intense argument in the Court room and the interference of the defending counsels, who pleaded with IPOB Leader and demanded he wait, as they will make sure his wish is granted. The World is ardently waiting the unveiling of IPOB Leader's testimony that scares not just the presiding Judge Binta Nyako, but the Nigeria Government. The curiosity to have a knowledge of this testimony is getting intense and the entirety of mankind, should demand that the accused Citizen Nnamdi Kanu should be allowed to give his testimony in the court of law. The truth can not be hidden forever, we shall win the battle. How did Buhari sister Binta Nyanko wife of a terrorist husband and mother to a criminal son became a Judge? This is evidence of a merit-less judge sitting on a merit-less bench in a fake fraudulent British experimented expired Nigerian worthless court. Binta Nyanko is so laughable. She calls herself a judge and she does not know that an accused person has the right to testify? It her brother Buhari who went and illegally arrested Nnamdi Kanu and paid Binta Nyanko a huge corrupt money which Rotimi Ameachi delivered to her with promise to provide Binta Nyanko and family 24 hour protection security. Binta Nyanko should know better that she can not use her corrupt blood money court/bench to silence the truth. Nnamdi Kanu and the other brothers are the accused. They defendants! Buhari her brother who is the plaintiff have already told his unfounded baseless tales against Nnamdi Kanu to the rest of the world! 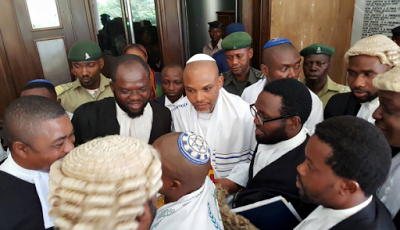 Nnamdi Kanu and the other Biafran brothers must also take the stand to testify! The world is waiting to hear why did Buhari ordered DSS to arrest them! Nnamdi Kanu must testify period!! !